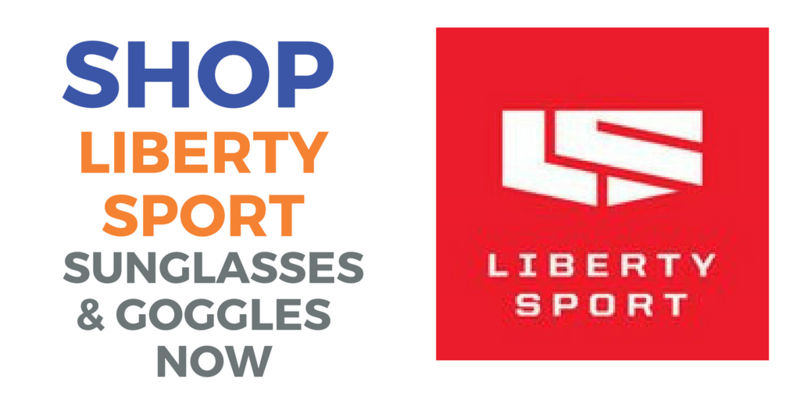 Liberty Sports and Rec-Specs Sports Glasses. Prescription available. 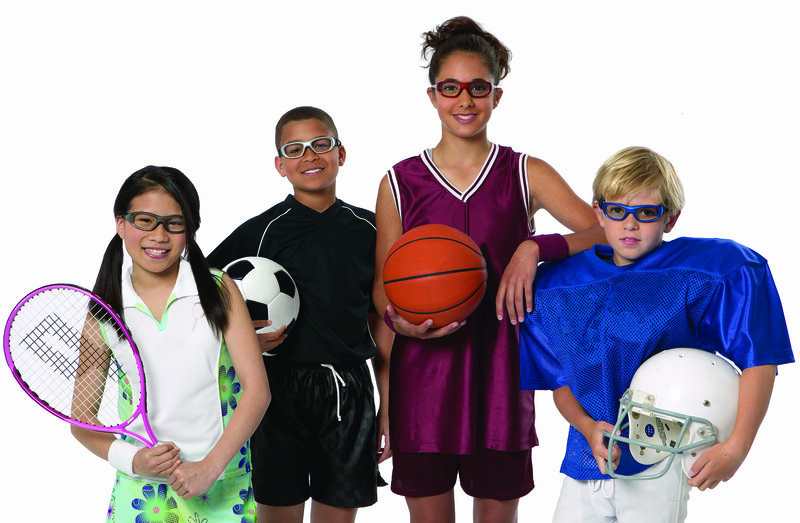 Rec Specs has been the leader in the growing national movement promoting eye safety during scholastic and recreational sports. 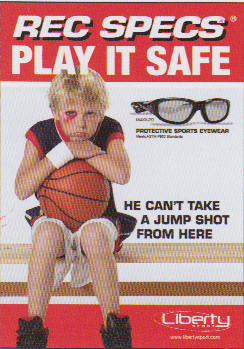 Introduced in 1978 as the first Rx-able protective sports eyewear, today over 20,000 eyecare professionals in the USA and the world, rely on Rec Specs when it comes to providing the best possible protective sports eyewear to both children and adults. sports-related eye injuries requiring costly emergency room care. This number could potentially skyrocket when you consider the treatment of eye injuries in a private practitioners office. As sports participation statistics continue to climb, and newly identified "extreme" sports gain in popularity, the number of athletes who fall victim to eye injuries has the potential to grow at alarming rates. School-aged competitors are particularly prone to eye injuries since their athletic skills (hand-eye coordination, balance, reaction time, and speed) are still being developed. However, regardless of an individual's age or skill level, every athlete's eyes are targets for injury. Under most circumstances, at least 90% of sports-related eye injuries are preventable with the proper use of protective sports eyewear. Rec Specs is the world's leading brand of high quality protective eyewear designed specifically for sporting applications. Most Rec Specs are tested to withstand the ASTM F803 impact resistant standards for racquetball, basketball, handball, squash, paddleball, and tennis when fitted with 3 mm polycarbonate lenses. Other Rec Specs designs provide use during activities in the water for things like swimming and jet skiing: to winter sports like skiing and snowboarding. Please refer to our descriptions below to find the correct model for you and the standards for the particular sport it is approved for. Although Rec Specs sports eyewear is intended to offer the best protection available, there is always the possibility that the wearer may sustain an eye or facial injury due to severe impact or because of the nature of the athletic activity. If the eye protector incurs a severe impact or is neglected or misused, the degree of eye protection provided may be reduced. In any case, the frame must be replaced. Failure to do so may result in permanent eye injury. THE DESIGNER, DISPENSER (A Sight for Sport Eyes), MANUFACTURER, AND LIBERTY OPTICAL MFG. CO. INC. DO NOT CLAIM THAT REC SPECS SPORTS EYEWEAR IS UNBREAKABLE OR ELIMINATES THE POSSIBILITY OF EYE OR FACIAL INJURY. All Sports Goggle styles meets or exceeds ASTM F803 impact resistance standards for racquetball, handball, tennis, basketball, squash, soccer and paddleball, and many more ball/stick sports. Polycarbonate UV 400 lenses. Available in clear and tinted (special order) Patent pending technology. ASTM F803 Approved. Available with your prescription. Note: No lens option to be filled with prescription lenses only. Frames cannot be worn without any lenses in them. Parts are available for some older styles. Call or use online chat to check availability. Prices for prescription are for lenses -4.00D and under in a 3mm thick polycarbonate lens. For higher prescriptions or additional lens options, please call or e-mail for a quote. If using our on-line order form to order prescription lenses, please note your prescription in the comment box. PD measurements are required to properly fill your prescription. Please note: You must add the frame to your shopping cart as well as the prescription lens. If your doctor will be filling the prescription, please note: Only polycarbonate lenses should be fit in these frames for safety. Estimated time: 2 to 10 working days. Want to customize your prescription lens? Click here for more information. Sizes are stated in millimeters. The first number is the distance across one lens in millimeters. The second number is the distance between the two lenses stated in millimeters. Therefore, to get the total distance measurement across the frame, double the first number and add the second. An easier way of measuring is if you currently wear glasses, check the size of your current glasses (usually written across the bridge or on the temple of the frame). 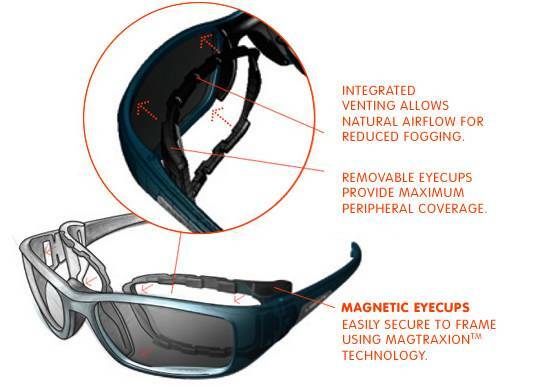 You will want your goggle to be a little larger than your regular glasses to maximize your peripheral vision. Liberty Sport Ultimate Sports sun lens is a combination of maximum impact polycarbonate lenses with premium tints and coatings that make for the best protection available. Ultimate Drivers: Made for speed and motion activities. Tint is tailored for a moderate level of transmission to provide both sustained comfort and uncompromised visibility under the varying conditions encountered. Ultimate Play: Designed to highlight the ball against the background (sky or grass). Unique balance of target and background brightness. Low hue mirrors will enhance the contrast without significantly changing the spectral curve. Ultimate Outdoor: Designed to accommodate the visual needs of the outdoor enthusiast. Lens is extremely useful in forested and offroad environments when faced with variable light conditions. Ultimate H20: Designed for water activities, providing superior protection and visual comfort. Water and Sky will appear "bluer and truer", the white peaks of the water and the clouds will "sparkle" while vivid colors will "pop". Ultimate Snow: Designed for perceiving changes in terrain while participating in a variety of winter activities. Sensitive filters highlight the critical red, green and yellow portions of the spectrum. This combination provides comfort in bright reflective conditions. Polarized Brown: Polarized warm brown lens that performs best in bright to moderate light conditions where there is a combination of reflected light and shade. Polarized Neutral Gray lens that performs best in very bright conditions where there is a lot of reflected light. Clear: Delivers excellent visibility indoors or out. Yellow: Great contrast under sunny, hazy or foggy conditions. Improves contrast on bright, hazy, or smoggy days. Gray: All purpose sun protection. Green: Provides a unique balance of target and background brightness. Polarized Gray: Polarized polycarbonate sun lenses reduce reflective glare. Specially designed grey tint increases contrast and visual acuity making objects sharper. Polarized Brown: Polarized polycarbonate sun lenses reduce reflective glare. Specially designed brown tint increases contrast and visual acuity making objects sharper. Photochromic (Transitions) Gray: Provides clear and comfortable vision in virtually any light condition. Photochromic (Transitions) Brown: Provides clear and comfortable vision in virtually any light condition. For full brand information, visit Liberty Optical's manufacturer page.